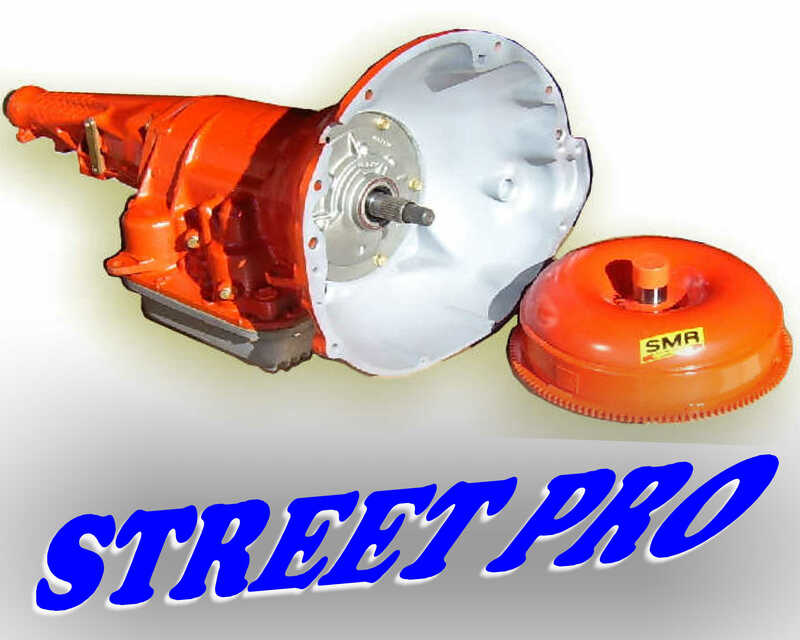 The SMR STREET PRO series transmission incorporates the latest technology and upgrades for enhanced performance and reliability in refreshed and moderately modified street/strip and performance vehicles. Shifts are FIRM and CRISP with the fully automatic shifts for true performance improvement. EXTERIOR:- is meticulously cleaned and inspected. The cleaning and surface refinishing process is accomplished by high pressure wash, hot chemical pressure wash, oxide blasting and final high pressure rinse. -all bolts, fittings, hardware and pan are glass beaded and clear coated to keep the original appearance. Every drainpan is equipped with a drainplug to make adjustments and fluid changes a much easier task. -the 2nd gear apply lever (kickdown) is replaced with a 4.2 or 3.8:1 ratio depending upon the designed application. - each component including the pump, clutch packs, servos, input and output shaft, are precisely BLUEPRINTED to the optimum clearance specification. - A new neutral safety switch and cooler fittings are installed for leak free performance and reliability. NOTE: These prices are quoted in U.S. Currency, valid only for sales in U.S.A.
IS THE STREET PRO series TRANSMISISON RIGHT FOR YOUR VEHICLE? SIMPLY FILL OUT OUR CLIENT TECH SHEET - AND WE CAN GUIDE YOU IN CHOOSING. (Click this line). -WE WOULD TAKE GREAT PRIDE IN BUILDING THE TRANSMISSION AND CONVERTER FOR YOUR VERY SPECIAL MOPAR.